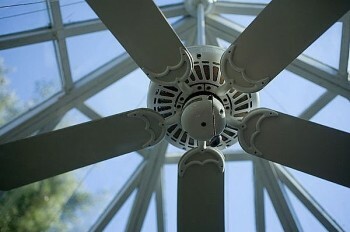 During the warm summer days ceiling fans provide us great relief and comfort. However, choosing the right ceiling fan for a room is not as easy as it seems; you cannot just walk into a showroom a pick the one up that is visibly appealing to you. You should consider the facts like the size of your room, the ceiling height, the quality of the components of the fan and various other details before you decide to buy the fan. An electrical contractor, who is specialized in this field, can provide you valuable tips to choose the right fan for your room, by taking into consideration the following factors. 1) Calculate the size of the room. At the outset; the electric contractor is going to measure your room to determine its size since, the larger your room is the longer should be the blade span of your fan and if your room is too big in size, he might suggest two ceiling fans. For a 100 square feet room, you are going to require a ceiling fan with blade span of 36” whereas if your room is somewhere close to 375 square feet the blade span should be 52”. The contractor is also going to determine the center of your room, since installing the fan there is going to provide you air in all parts of the room and for safety reasons; he is never going to place the ceiling fan over your bed. 2) Consider the ceiling height. The electric contractor is then going to measure the height of the ceiling to determine the type of mount required for the fan. Generally, a fan placed at 8’ or 9’ from the floor gives you the best result; however, it can even be installed at 7’ from the floor but not lower than that and some buildings make this height mandatory through a code. If your room has low ceiling, he can install a flush mount and in case of high or sloped ceiling he is going to use a down rod to install the fan at the preferred height. The quality of the components of the ceiling fan is a very important factor and your electric contractor is never going to advise you to compromise on quality for price. Always try to buy a fan having heavy, die-cast parts, since these are going to reduce the noise of the motor and would restrict the fan from wobbling. Choose mounts with sealer bearings and permanent lubrication as these last longer. Another thing that you should check for is the weight and balance of the blades as also for a good warranty. The blade pitches of a ceiling fan range from 8 to 15 percent; your electric contractor is always going to suggest you fan blades with higher pitches, since higher it is the more is the circulation of the air in the room. Dimmer switches, specialized lighting fixtures, controls that can program the speed of the blades to match the air temperature of the room automatically, wireless remotes, color of the fan to match your room paint, etc. are some of the other options that your electric contractor can suggest and carry out for you. 5) Evaluate your electrical needs. Many fans use lighting fixtures; therefore, your electric contractor is the right person to suggest whether you can install these fans or not since, he can determine the type of fans that can be supported with the current electric circuits in place and whether these are required to be upgraded or not. If you want to install fans outdoors or in damp places, your electrical contractor is going to do it with special wiring. Take his help and not only install the perfect fan in each of your rooms but also have the peace of mind.